Earlier this year I wrote about the importance of the time a winemaker has worked in the same cellar, especially at wineries that aren’t family owned. I thought again about this topic when the news broke first that Miles Mossop would be leaving Tokara, where he’s taken the wines from strength to strength since the maiden vintage; he started there in January 2000. Worthy of note too is that his fellow winemaker, Dumisani Mathonsi has added to the cellar’s collective service, joining Mossop in January 2004; that will be 32 years between them when Mossop leaves after next year’s harvest. Add a further 17.5 years for viticulturist, Aiden Morton, who came on board in November 2000, and any thoughts of coincidence that the wines have shown such consistency and performed so well can safely be put to one side. But what of Mossop’s successor, Stuart Botha, who himself has been at Eagles’ Nest since 2007? Botha joined Steve Roche, who was also viticulturist, in the cellar, both guided by the sensitive hand of Martin Meinert, who still consults. 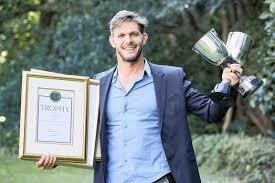 It’s good to note too that Kobus Jordaan, as familiar with the Constantia valley as any, will chalk up his 10th anniversary as viticulturist in 2018. Again, longevity of service reaps its own awards and sales! 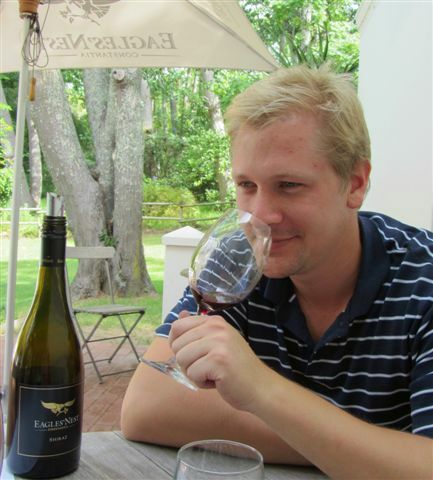 Anyone lucky enough to have driven around Eagles’ Nest with Botha will be aware of the very different altitudes, aspects and other physical attributes of the vineyards are; they will also have benefited from his deep understanding of each block, a knowledge that comes only with many vintages. It’s always a relief the drive is accompanied by his informative detail; the steep, rocky tracks are not for those who suffer vertigo, as spectacular as the views are! My most recent visit there, a couple of months’ ago, was with Dreyfus-Ashby’s Richard Kelley MW (an untiring promoter of South African wine, who, of course worked here for several years) and Jo Locke MW of The Wine Society where South Africa is part of her portfolio. After the farm tour, we tasted through the range, one or two vintages of each wine and three of the shiraz, including the then just-released 2014; a tricky year. Botha recalled his difficult decision to pick considerably earlier than he would have liked due to imminent rain but he felt waiting until after the rain would have been leaving it too late. His decision, and those made in the cellar, have been vindicated with a wine that’s already made the Shiraz Association Top 12, a regular in that event. Whereas the 2012 reflects this big vintage, full of richness and concentration, 2014 enjoys more gentle succulence in its spice and fynbos flavours. Freshness and tannins are perfect in both. That afternoon, 2013 was still a bit closed. I have followed Eagles Nest since their first 2005 vintage, as their Platter taster in the early years; to much laughter, we recall my ‘promising’ 3.5* for the first shiraz, followed by 5* for 2006 and they haven’t looked back since. My immediate reaction to the news that Botha was leaving Eagles’ Nest was one of surprise, on reflection and with Botha confirming he couldn’t think of another winery he’d want to go to than Tokara, I saw it as another wonderful opportunity for him. If Mossop’s shoes will be big ones to fill at Tokara (the latest achievement: top producer on 2017 Trophy Wine Show), so will Botha’s at Eagles’ Nest (as I write, they have yet to be filled). 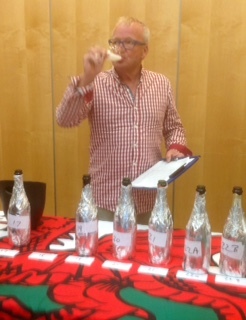 Pieter ‘Bubbles’ Ferreira, cellarmaster at Graham Beck for 27 years, tasting (what else!) sparkling wines. These moves did get me thinking about how many winemakers, not family-members on family-owned wineries (nor the former co-operatives), have been at the same winery for ten years or more. A thought I aired on social media with some surprising results. Surely the king is Pieter Ferreira, 27 years at Graham Beck but the others that came to light (not in any particular order of anything! ): Matthew Copeland/Vondeling, Rianie Strydom/Haskell, Louis Strydom/Ernie Els, Corlea Fourie/Bosman, Rudi Schultz/Thelema, Carl Schultz/Hartenberg, Gunter Schultz/Tamboerskloof, Chris Williams/Meerlust, Andre van Rensburg/Vergelegen, DP Burger/Glenwood, Susan Erasmus/Vrede en Lust, Pierre Wahl/Rijks, Frans Smit and Anton Swarts/Spier, Yvonne Lester and Schalk-Willem Joubert/Rupert & Rothschild, Edmund Terblanche/La Motte, Dewaldt Heyns/Saronsberg, Sean Skibbe/South Hill, Abrie Beeslaar/Kanonkop, Herman Kirschbaum & Brad Paton/Buitenverwachting, Boela Gerber/Groot Constantia, JC Bekker & Lizelle Gerber/Boschendal, Sjaak Nelson/Jordan, Martin Moore/Durbanville Hills, Charles Hopkins/De Grendel, Neil Groenewald/Bellingham, Debbie Thompson/Simonsig, Nico van der Merwe/Saxenburg, Francois van Zyl/Laibach, Wynand Grobler/Rickety Bridge. That’s 36 and there may well be more. I haven’t checked on viticulturists but it would be interesting to know how many on these and other farms, have ten and more years of service. Add the family-owned wineries not included here and surely we have even a small clue as to why South African wines are doing so well and being spoken of with much more respect recently. Long may it continue!